Among the veritable flood of questions that I was asked about this epic trip, without a doubt the most common one would be the seemingly simple question of “Why?” In retrospect this question of “Why” would prove to be both a source of great strength, and equal amounts of frustration, as I struggled to find an answer that fully encompassed the truth of just exactly why, while having a mostly functioning car, I was deciding to walk 2181 miles on foot from the foothills of Georgia to the lakes of Maine. If you seem confused let me start at the beginning of my hiking interest. Last October I got it into my head to go to Ireland for the second time in my life. Having already gone once before with my brother and sister, I really wanted to see some of the small town and country life. Also, I missed the lovely culture and powerful sense of excitement I got while in nature on my last visit. I decided to take the Wicklow Way walking path from Marlay Park, south Dublin, through the Dublin and Wicklow Mountains, and down past forests and farmland to Clonegal, 82 miles to the Southwest. Once the idea of walking the Wicklow Way was firmly lodged into my head, I realized that I needed some camping gear so I could camp out and save money by not having to stay in hostels and B&B’s the whole way. And thus, my introduction into the wonderful world of backpacking began with a trip to my local outfitter to get me started. Having spent copious amounts of cash faster than even I thought possible, I eagerly loaded all of my gear into a massive 110 liter backpack and proceeded to find a good place to test out all my fancy new gear. * As a brief aside I had to comment about the fact that my “luxury” custom backpack, had the claim that it could “comfortably carry 75lbs”, a claim that only after actual walking with a backpack for more than a mile at a time, do I find hilariously funny, primarily due to the fact that it has never even been close to “comfortable” for me to carry 75lbs regardless of the backpack. While it may be doable for some of us to haul such weight, it’s certainly not comfortable in the normal sense of the word. With new gear to be tested for the trip to Ireland, I Googled “camping in Connecticut” and eventually stumbled upon a little 7 mile section of the Appalachian Trail, also called the “A.T.”, that looked fairly easy for a few novice campers first night. I quickly recruited two of my best friends that happened to be free, and our merry little band set off that weekend in mid September, at about 2pm on a Saturday with hopes of spending the night at the Sharon Mt Campsite near West Cornwall, CT. I first knew that this would be an interesting trip when it took 3 fairly intelligent guys about 2 hrs to find the right two parking lots to drop our cars off at and actually begin hiking. I sweated so much if those first 30 minutes I thought I may slide out of my clothes. The cool and crisply refreshing New England air didn’t seem to be getting to my lungs that much let alone my sweaty body. I felt like every foot step was a small battle that my boots where trying to win against their enemy the ground, and it was a hard battle that I felt I was losing with each step. Without weighing our packs I truly never did find out how much we each carried that day, but I’d guess it was in the 50 lb range. With only 1 real climb before a “gentle” rolling section on a ridgeline, I’d assumed that it would be a walk in the park. However I was proven wrong and found it to be much harder than I’d anticipated to even carry that much stuff on my back for 5 miles. Even with all the sweat and toil involved in going to the campsite I will forever remember the following moment. The three of us were trudging along looking forward to eating and relaxing after our little Sherpa adventure in carrying heavy loads for longer than we wanted too. We were headed south and saw a heavily bearded young man with what looked like a daypack humming along to himself as he walked at a blistering pace toward the three of us. We briefly exchanged greetings and I asked how far he was going and he replied that he was “NoBo and looking forward to finishing his thru-hike”. With what must have been a dazed expression on my face I quickly ask him a few clarifying questions like “what is a NOBO and a thru-hike”? He was very gracious, albeit a little rushed, and briefly outlined that a thru-hiker was someone who tried to hike from Georgia to Maine in about 6 months through 14 states, while walking over 5 million steps to go almost 2,200 miles! I didn’t even know that the A.T went all the way to Georgia or Maine, and was astounded to find out that people actually walked the whole thing in one trip. And thus the seed of insane interest was very subtly planted in my head. Our little overnight adventure was a rousing success from the standpoint of a fun overnight fling, and we had a blast eating Dinty Moore Beef Stew for dinner and bacon and eggs cooked over a canister stove for breakfast. We spent the rest of the evening sipping Jameson whole enjoying the cool evening sky and good conversation. I realized that I needed to carry less to enjoy myself more, and it took one overnight on the A.T and then 6 days of hobbling through the beautiful Irish country side to realize that as much as I enjoyed hiking, I hated carrying stuff on my back! I returned from my hike in Ireland with the desire to try this crazy thing called a thru-hike of the A.T. With the miles of hobbling along the Irish countryside still fresh in my mind, I knew that I’d have to go about a thru-hike much differently than my trip in Ireland. My first stop was once again Google, and I quickly found whole websites that amazingly devoted themselves to helping people hike farther and with more enjoyment, while also hiking with much less stuff and much lighter stuff. My first order of business was research, which I did religiously for the next 5 months leading up to my thru-hike. Knowing next to nothing about anything that would help me in my attempt, I buckled down and read articles about different types of sleeping bags and why people would choose a certain type over another. I learned about how to pick lightweight and calorically dense foods and figure out how much food I would need each day. I learned about tent materials, water treatment methods, and the difference in stitching patterns and material used in tent rain covers. 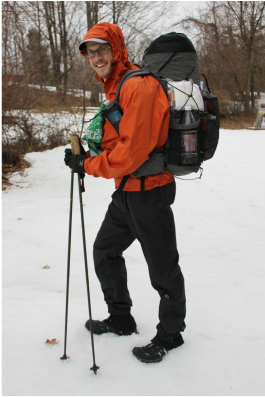 While it was a very intensive study and involved many late nights of reading, it helped me to try and determine what type of hike I wanted to hike and what I would likely need to succeed in my attempt while being both safe and carrying as little weight as possible. I know without a shadow of a doubt that if I had not done the research I did, I would likely have been unsuccessful in being able to hike the trail the way I desired too, which turned out to be the same way I like to trail run, fast and light. My next order of business was to immediately sell things like my 7 ½ lb 110L monstrous backpack and buy a much more suitable 1 lb frameless 50L backpack that would use my sleeping mat to provide the “cushion” along the back of the bag and a trash compactor bag to stuff everything into and keep it dry! I invested a large amount of money into making sure that I had only quality items that would serve multiple purposes and keep my overall load to a minimum, and I am glad that I spent the money up front on items that I researched and planned into my multiple layers of protection system of gear purchasing. This system relied on only three layers of clothing to suffice for multiple different weather patterns for many seasons. The simplest way to describe it is having a rain and wind proof layer on top, a warm insulating layer in the middle, and a synthetic sweat wicking layer on the bottom next to your skin. Using differing combinations of these three layers I was able to be comfortable or at least safe while walking around in temperatures ranging from 18* to 105*. As a last ditch safety bail out, ensuring that sleeping bag stayed dry ensured that if all else failed I could set up my tent and rewarm in my sleeping bag. With all the time and effort I’ve been putting into researching this trip, I’ve realized that preparing for a long distance hike has its own beauty, frustration, and obsession to it. I've weaned, clipped, sorted, repackaged, obsessed, stared in a dazed zombie coma from hours of online reading, and been in amazement at the technology of all these things until I'm brain tired. When I get brain tired I know its time to quit. I've done about 5 months of concentrated late night research – and that’s a LOT of research. It has all been done to try and fill this newbie hiker knowledge void to help stem the tide of errors and beginner mistakes that could prove both costly and time consuming to fix while on the trail. I hope that this preparation, of both physical training hikes with a full pack and the copious knowledge acquisition, will be enough to help offset my relative newness to this fascinating world of thru-hiking and lightweight backpacking. I also have had to basically "crash course" my way into a whole new way to enjoy hiking -- by doing it as simply and lightly without sacrificing my ability to be safe or comfortable enough to enjoy myself. Overall, after figuring in the money I got back for the old camping gear that I sold, it looks like I've spent about $1,000 over that on gear. While not cheap by any means, I feel that it is reasonable given the fact that I've created both a "home" and "possessions" that will hopefully suit my purposes well and last me for around 150 days. This is way cheaper than rent, hydro, and electrical for 5-6 month's time. Cost wise it turns out to be about $350 a month or less depending on how long it takes me. Well, I got it into my little old head to try and section hike the 56 miles of the Connecticut portion of the A.T. before I leave. My hope is that this hike would allow me to shakedown my gear selection and make sure it worked exactly the way I was hoping it would. I also figured that this would be a good training hike to really test out my fitness while carrying a backpack. Boy did it ever. 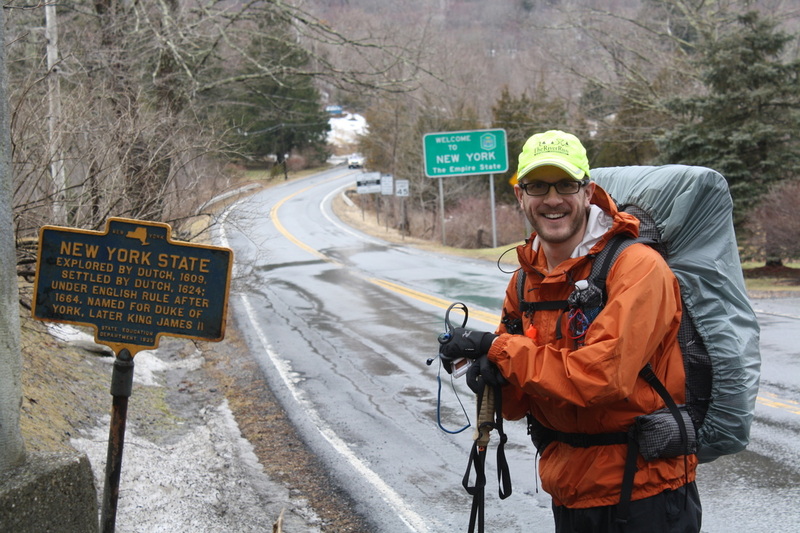 I decided to get dropped off at the NY/CT border at 11:45am on Friday 3/11/11 with my 3 day bag weighing 20.5 lbs, just in time for the post rain storm disaster scene and above flood level water at the Housatonic River. Well let's just say it was only 11.4 miles to my first nights shelter at Mt. Algo (I wanted to try shelter camping so since I didn't have my waterproof bivy in yet, but had my inner net tent - wanted to see how it worked set up inside a low shelter) but that 11.4 miles took me about 6 1/2 hrs of strenuous hiking with a raging torrent of a river sometimes as close as a few feet away from me. Every little brook crossing turned into a 20 min hunt for a fallen log to cross on, and at 2 locations I actually had to take the suggested blue blaze to get around an impassable crossing. I did end up seeing 2 whitewater kayakers, and they said it was awesome weather, so I guess it’s all about perspective. My first day out I spooked about 15 deer on top of Schaghticoke Mt, saw a nice owl flying to a nearby tree, and also saw a very confused black bear that looked very nonplussed about being awake. I gave a few "hey bear" greetings and got a head turn as my reward, but he didn't look too awake yet and probably needed a coffee. I rolled into the Mt. Algo Shelter around 6:30pm and noticed that the temperature was dropping quite a bit. I'd been through so many swampy and wet areas that my trail runners with my toe socks had been wet the whole time and yet had not gotten a single blister. Started boiling water for my ramen with salmon as I set up my net tent. Changed into my jacket and pants and down booties and comfortably read the shelter logbook for about an hour while I ate, and then promptly hit the sack at 8:00pm. Woke up around 1am and was actually too hot with my booties, jacket, pants, fleece hat, and bag in the net tent - after a little clothing rearrangement got settled back in - and woke up at 7:30am. Great sleep on my Neoair and though heavy seems to do the trick for a beginning hiker looking for a super comfortable nights sleep. Saturday dawned bright and cold and I ate 2 packs of oatmeal before shoving off at 9am to try and get to the Pine Swamp Brook Campground, about 14.7 miles away and a little optimistic given my speed the previous day. All said, it ended up taking me 9 1/2 hrs of straight hiking to get about 16.2 mile of trail that included 2.5 miles of alternate rooting, backtracking from impassable crossings, and a full 1 miles blue blaze to get around the normally tame Stony brook. With only a 5 minute sock change for a break during the day, I developed a blister on each big toe using my wool hiking socks with silk liners on this second day of hiking. I’ll be leaving them home and buying a second pair of the toe socks. This was the hardest hiking I've ever done, bar none, and I maintained an average heart rate was in the 80% max range, and that's the high end of the HR range I'm in during a running or triathlon race! The trails had everything from mud slides, knee deep snow, snow over hidden streams, barely passable iced over rock scramble sections, flat dry dirt sections, road walking, farm pastures turned to ankle deep bogs, multiple water crossings that ended up mostly involving me scrambling over icy logs on my belly. At about 4:30pm I realized that my idea of one more night on the trail was overly optimistic given the conditions, and a quick phone call home got set to meet my bailout ride at the West Cornwall Rd. crossing. It took the equivalent of a forced march, but I got there just about the same time my ride did. Covering 27.4 miles plus another 2.5 miles in detours was pretty good given the conditions, but not quite the full CT section that I’d anticipated doing all at once. Would I do it again in these conditions? Probably never again unless I had too - but I do think that it has certainly shown me the possible worst conditions to hike in that I may encounter, barring a tornado, earthquake, meteor shower, or alien attack. As a final treat to lighten the difficulty of the conditions, I found a beautiful deer antler on the side of the trail, and carried it for 5 miles to the car so I'd have a souvenir of my trip ! Some great overlooks and beautiful sunsets both days meant that though it was physical grueling, it was also very satisfying to have experienced the trail at a time when most people never will. Gear wise I was able to finalize what sleeping mat, backpack, sock, shoe & gaiter combination, and in camp thermal clothing that will be needed for the trail. Though not what I anticipated for my hike, it worked out perfectly and allowed me to test my gear under somewhat extreme conditions that may end up mimicking actual conditions of the trail when I begin hiking it in earnest. Thru-hiker motto that I was told before beginning: "If you won't hike in the rain and endure pain, you'll never reach Maine!". So without further ado let get walking, because No Rain, No Pain, No Maine...Bring it on because I'm ready to go!